There was just one flaw in this arrangement – I am terrible at traditional sponge cakes. They are my favourite kind of cake and I just can’t make them. I gave up even attempting them about twelve years ago, in fact, because the results were too depressing. So I thought I’d better make a practice cake, and turned to Margaret Fulton for help. It turns out that I’ve actually improved a bit as a cook in the last twelve years (having an oven with accurate temperatures probably helps) (Actually, taking a recipe seriously when it says ‘pre-heat the oven’ helps a lot too – I only figured that one out about ten years ago, and the results have been astonishing. If you have been putting your cakes into cold ovens and wondering why they weren’t working – that’s why). Anyway, between my increased baking skill, my improved ability to work out which instructions really do need to be followed, and my more accurate oven, my practice cake worked rather well and disappeared rapidly when I took it in to work on Monday, so this morning I got up bright and early, ready to make a lot of sponge cake. … Which is how I, a self-confessed sponge incompetent, came to invent my own recipe for gluten-free (and, as it turns out, low-fructose) sponge cake this morning. And, astonishingly, it worked (possibly because I used a Margaret Fulton recipe as a template – and nobody is more reliable than Margaret Fulton). Though it is even more finicky and fragile than the kind you make with wheat, so be warned. This sponge is very light and fluffy in texture, and mine had a lot of holes in the bottom, which caused me concern, but when it was sliced, the actual grain of the cake was properly light and spongey – the holes didn’t go through the cake at all. 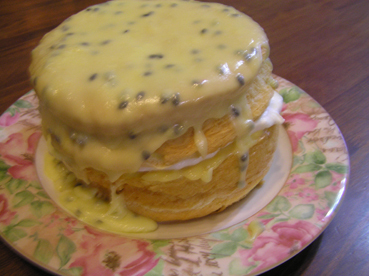 And with a lemon curd and cream filling and passionfruit icing, it was truly delicious. Preheat your oven to 180°C. 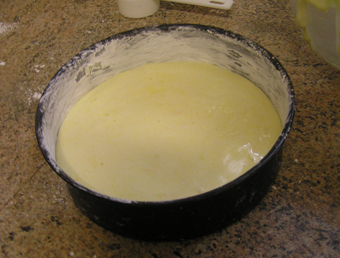 Grease 2 x 18 cm cake tins with a bit of butter, then put a bit of cornflour in the pan, and turn the pan and tap it, so that the cornflour sticks to the butter and the whole inside of each pan has a cornflour coating. 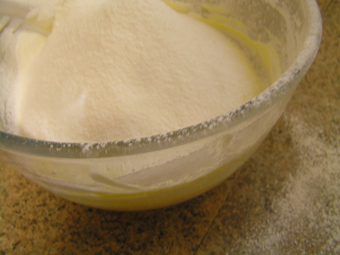 Sift together the cornflour, salt and baking powder three times. 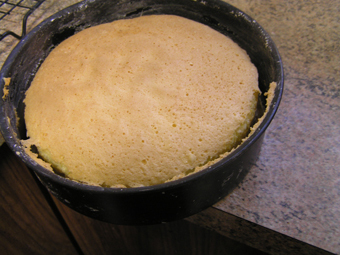 Don’t skip this bit – I generally don’t bother sifting flour in other recipes, but sponges need it. I understand that this gets more air into the flour – at the very least, it removes lumps, which cornflour is very prone to. Ideally, sift it onto a piece of baking paper, pick the sheet of paper up by its corners and then tip it into the sieve over a second sheet of baking paper, then repeat and sift it back onto the first. 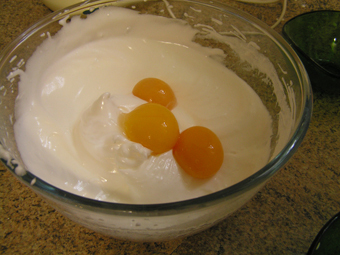 Beat the 4 egg whites until you have fairly stiff peaks – you want them to hold their shape firmly, but you don’t need to have them at the ‘turn the bowl upside down over your head without having a surprise meringue shower’ stage. 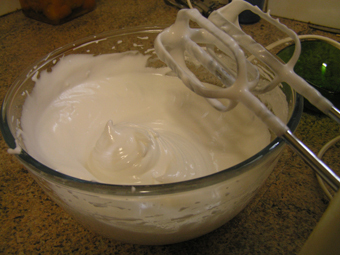 Beat the sugar in in three batches, until the meringue mixture is nice and thick and a bit glossy. Really, you’ve just made meringue. Even the proportions are nearly right. Put the beaters away now, and don’t so much as look at them for the rest of this recipe! Get out a spatula, preferably a silicone or rubbery one, and gently fold in the egg yolks. After folding in the egg yolk. It’s ok if it’s a bit streaky at this point. 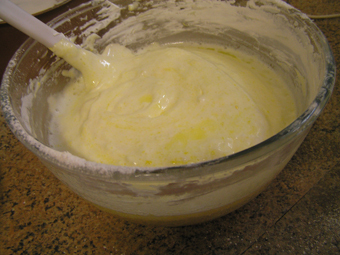 Pour the just boiled water and the melted butter down the side of the bowl into the batter, and fold everything some more – it will loosen up alarmingly at this point, but that’s cornflour for you – then quickly get it into the two tins and into the oven. Two things to watch here: don’t bang the tins around to settle the mixture (which should be liquid enough not to need it, but this is a good rule for any sponge), and don’t be so slow that the whole mixture gets bored and decides not to bother rising. Once the cakes are in the oven, don’t mess with them. They will need at least 20 minutes, probably more like 25, but definitely do not open the oven door for the first twenty minutes. And, while you don’t need to tiptoe around the house, I also don’t recommend jumping up and down in front of the oven. These cakes are fairly fragile. I find these cakes come away from the tin incredibly fast. The cakes will be done when they are nicely golden and you get a bit of resistance when you press the centre lightly with your finger. The skewer test works reasonably well here, but you risk deflating your cake. 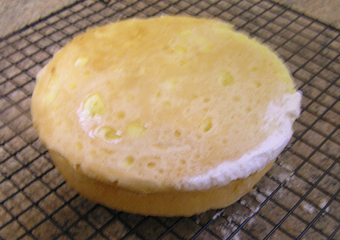 Keep the cakes horizontal as you take them out of the oven – they will start coming away from the sides almost immediately, and will slump in any direction you allow given the opportunity; I found that turning each cake in turn very quickly onto my hand and then back onto the cooling rack caused minimum deflation and maximum evenness. Though I did burn my wrists doing this, so maybe an oven mitt would be a better plan. Holes on the bottom of the cake. No idea why and they don’t affect the texture, so don’t let them worry you. This all sounds horribly intimidating, but it isn’t quite as bad as that. Even my sunken sponge tasted good and had a pretty good texture. And it mostly sank because I had no idea how fragile it was and manhandled it a bit too much – just being aware that you need to be a bit delicate will probably be enough to rescue you – I’m completely clumsy and I still managed it, once I realised what was required. Another good thing not to do is decide that the cakes aren’t going to rise all that much and there’s no need to shift the upper oven rack a bit higher. 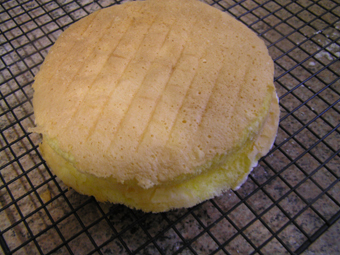 When good sponge cakes go bad – close encounters of the oven rack kind. 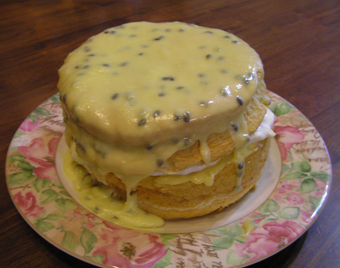 Once the cakes are cool, make the passionfruit icing (I suggest that you make lemon curd the day before, incidentally, so that it is cool. Or you could buy it, but that’s much less fun, and not as tasty). This is really easy, you will be glad to here. Cut the passionfruit in half, and scoop all the pulp and seeds into a bowl. Sift in the icing sugar and mix until you have a thick icing (if it’s really far too thick, add a little lemon juice or water). Beat in the soft butter, and then microwave the whole thing for about a minute on 50%, until it’s liquid enough to pour onto whichever cake is going to be your top cake and then spread out a bit. 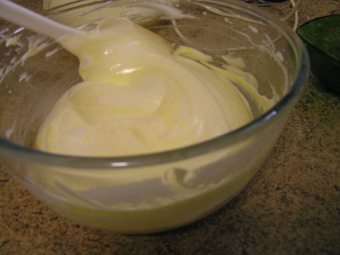 Spread the lower cake thickly with lemon curd and then with slightly sweetened, well-whipped cream – you don’t want butter, but you want it to be fairly firm about holding its shape, otherwise it will all start spilling out the sides and the top cake will slide gently off the bottom one. If, like me, you are overly generous with your filling, that might still happen, but at least you have given it a fighting chance. 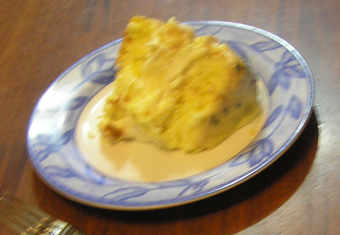 You can make this dairy-free by using a dairy-free margarine to replace the tiny amount of butter in cake and icing. Sandwich together with apricot jam and maybe crushed tinned pineapples instead of cream, or with coconut and lemon buttercream (rich, but entirely dairy-free) and ice with passionfruit icing as above. Eggless sponge is still beyond me, sorry! And I don’t think sponge cake is going to be particularly low-GI any time soon, either. You can, of course, sandwich this together with anything you like, and you can also top it just with sifted icing sugar. And you can cut the halves into layers and have more layers, too. If you don’t plan to eat this cake the same day you make it – which you really should, if possible – it’s not a bad idea to brush it all over with a lemon and sugar syrup, to keep it moist. If you want a larger cake, a double quantity of this recipe will fit two 22-23cm sandwich tins – but unless you have an extra wide oven and can fit both cakes on one shelf, I recommend making 23cm cake at a time. 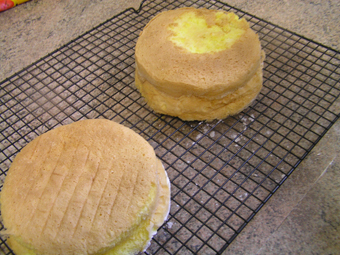 I learned the hard way yesterday that even if you wait for most of the cooking time before swapping your cakes around in the oven, they will still try to sink into interesting sin-wave cake shapes, which are excellent for fitting more lemon curd between layers, but not ideal on an aesthetic level. YUUUUUUUUUUUUUM! Sorry iwas unable to partake maybe next time. Yeah, the recipe I saw wanted me to beat it for 10 minutes. I get bored long before then, which is why I decided to strike out on my own. And thank you! This recipe worked really well for me. I’m not a “baker” at all but needed to make a GF sponge for someone and it was a success. Great job! Thanks Warwick! This is my absolute favourite kind of comment, to be honest! It always makes me happy to know that my recipes work for non-bakers. And I must admit, I’m pretty intimidated by sponge cakes myself, so I’m particularly happy to know that this worked out for you.